with the final event last night in Boston. A few things became quite clear at Wednesday night’s public hearing on the draft environmental impact statement on the Cape Wind project. The first was that about twice as many Vineyarders, assuming those who attended are broadly representative of Island opinion, oppose the project as support it. The second was that those against the development of a wind farm on Horseshoe Shoal in Nantucket Sound were motivated primarily by local and personal concerns, including their livelihoods, tourism, fish stocks, birds, taxes, and — to acknowledge the elephant in the room — aesthetics. Those in favor, by contrast, were primarily motivated by national or global worries, such as the need for American energy independence, the skyrocketing cost of oil, and the need to take decisive action to mitigate global warming. And the third thing which became clear was that by far the most controversial part of the Minerals Management Service findings on the likely impacts of the huge project related to its effect on fishing. The one criticism of the draft environmental impact statement which was most often made by opponents, and unchallenged by supporters of Cape Wind, was that the minerals management service had got its facts on fishing very wrong, grossly underestimating the quantity and value of fin, flat and shellfish and squid taken on Horseshoe Shoal. Fully one-third of those who spoke in opposition to the project did so in whole or part on the basis of concern about its effect on the ecology of Horseshoe Shoal, about its effect on catches or about access to the fishing grounds if the project goes ahead. In all, Wednesday night’s hearing heard from about 48 people against Cape Wind and about 23 in favor of it. A couple of others were hard to categorize. The meeting, at the Martha’s Vineyard Regional High School, was attended by about 350 people, although numbers dwindled during the proceedings to fewer than 100 people at the end. The public hearing was one of a series on the Cape, Islands and Boston this week, intended to elicit community response to the 2,000-page draft statement released in January. Views raised at it will be considered — along with written submissions, of which there are well over 3,200 so far — before the final statement is produced, sometime this autumn. Cape Wind, if approved, would be America’s first offshore wind farm, with 130 turbines, each 440 feet tall, installed at intervals 1,800 to 2,700 feet apart, over 25 square miles on Horseshoe Shoal, in federal waters in the center of Nantucket Sound. Wednesday’s hearing began at 5 p.m. and enforced strict time limits on speakers — five minutes for public officials and three minutes for everyone else. It still took almost five hours to get through all the speakers. Few people ran over their allotted time, although the skills of the stenographer were tested on occasion by people talking at high speed to try to get more words on the record. Things proceeded in a generally civil way. The mixture of strong opinions and generally good humor was in evidence from the start. When the moderator asked if anyone had emergency medical technician training, in case of illness, one crowd member said he did, but that his willingness to help might depend on which side of the issue the patient stood. There followed a couple of short briefings by Minerals Management officers. The final environmental impact statement, they said, would be completed some time in autumn, and the record of decision produced about 30 days after that, in early winter. Local officials got the first chance to express a view. With greater or lesser degrees of passion, most spoke against. Roger Wey, Oak Bluffs selectman and county commissioner, and Tristan Israel, Tisbury selectman and county commissioner, both spoke relatively mildly against Cape Wind. Margaret Serpa, representing Edgartown selectmen, was stronger in her language. She called it a “senseless act of destruction” and supported alternative projects she said the town was working on. Chilmark selectman Warren Doty made the first of the night’s many assaults on the accuracy of the draft statement’s assessment of the impact on fishing. Susan Shea of the Martha’s Vineyard Commission predicted bird kills, major damage to the tourism industry, increased imposts on the public to subsidize the project, and an exodus of families from the Island. But Richard Toole, also of the commission, supported the Cape Wind. He spoke of the crisis of global warming, America’s profligate use of electricity, and argued that the nation should at least stop fouling the air in the process of making power. Jim Helm, a former chairman of the Martha’s Vineyard Commission, objected to the private taking of public land. Peter Cabana, of the commission and Tisbury representative on the Cape Light Compact, a civil engineer with a background in energy projects, addressed the growing cost of fossil fuels, as well as the pollution they caused. The array of arguments both for and against the wind power project was broad. Cheryl Andrews-Maltais, chairman of the tribal council for the Wampanoag Tribe of Gay Head (Aquinnah), put a spiritual argument. The Wampanoags were the people of the First Light, she said, and the eastern view as it had existed for hundreds of years was important to cultural practice, she said. Hillary Conklin of Tisbury focused on the danger to six million birds which transversed the area, and the danger of a spill of up to 40,000 gallons of transformer oil. She distrusted the experts’ assessments of the likelihood of a mishap. “After all, the Big Dig turned out fine,” she deadpanned. Mark Foster, an Aquinnah summer resident, questioned the turbine pylons’ capacity to withstand heavy icing in winter and raised concerns about bird deaths, particularly two endangered species, the roseate tern and piping plover. 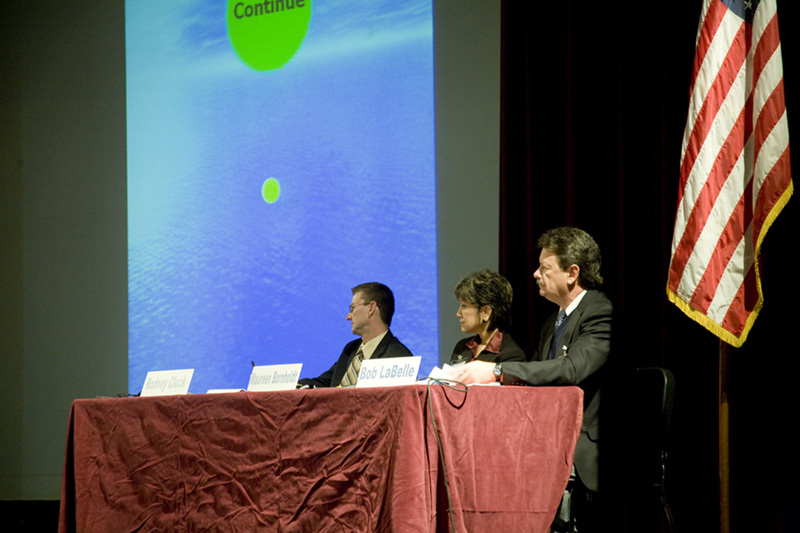 Malcolm Jones of West Tisbury suggested moving the project to a less sensitive site, such as Otis Air Force base, which was already environmentally degraded. Richard Brown suggested tidal generators. Garrett Orazem lamented the loss of the best sailing area in the northeast of the United States. Other more arcane concerns expressed by opponents included the effects of “underwater megahertz” on whales, and even more arcanely, the consequences of “electric eon” [sic] in the water. But above all other concerns was fishing. Every time a fisherman spoke, loud applause and sometimes cheers followed. There were more than a dozen of them and they all had one theme: that a lot more fish and shellfish are taken from Horseshoe Shoal than the proponents or the draft statement acknowledge. One of them, Tom Turner, said he was speaking for a group with a collective 1,042 years of fishing life experience on Horseshoe Shoal. Only about half as many people spoke in favor of Cape Wind, but they also mustered a large number of different arguments and presentation styles. A cowboy-hatted poet from Oak Bluffs, James Cage, delivered his support for the project, and his oblique shots at the Save Our Sound organization which opposes it, in verse. He encouraged people to take the big picture view of a long-term shared social benefit, rather than focus on immediate concerns of cost. Most speakers against the Cape Wind project made a point of distinguishing between their general support for wind power and their specific objection to this project, a position which brought several accusations of the not-in-my-back-yard syndrome, or nimbyism. She said such a privileged community as this one was particularly obligated to do something about global warming. She evoked images from a recent trip to Cambodia, where people were starving due to drought brought on by climate change. Likewise Nick Van Nes, of West Tisbury, said the war in Iraq was a direct consequence of America’s addiction to oil. Philip Henderson of Vineyard Haven invoked a sense of urgency about the problem posed by climate change, saying given the short time available for mitigating action, the process of consideration for Cape Wind had already been too long. And a man who did not give his name took issue with those who claimed having to look at windmills on the horizon would damage their quality of life. If the Greenland ice sheet melted, resulting in a 200-foot rise in sea levels, “I submit that will have a detrimental impact on the quality of life on this Island,” he said. So it went, back and forth all night. And a little before 10 p.m. it ended, and everyone went out to their cars — a high proportion of them large sport utility vehicles, it must be said — to travel home, courtesy of fossil fuel. Except for Chris Fried of Vineyard Haven, who rode his bike. I can't see how it makes any sense to build wind turbines in the ocean, when so much State and Federal lands are available for free? Despite the environmental concerns, the cost to build turbines in the ocean, to transport the power, to maintain and service, will all far exceed the cost if they are located on land. The biggest cost is the alienation and fracturing of a community this whole mess is causing, when locating the turbines on land will solve all these issues, including a greater profit for the promoters. We do need non polluting power, but why put at risk an oil spill in the ocean from a collapse of a turbine, or the other numerous concerns raised, when there is so much empty land? Thank you Jim Helm for bringing your opinon to the meeting about the taking of public land for private enterprise. The public will be paying for this project in more ways than we could possibly count or imagine. Tax credits for the project that come out of our pocket, which means borrowing money to construct these monoliths will cost next to nothing. On top of the tax credits, giving up land to private enterprise (miles upon square miles, losing prolific fishing grounds, and in the end having to pay two to three times as much for this future energy more than we pay for energy now. Addicted to oil. That's what the NIBYists are:plain and simple. The anti-clean power people are pulling all the same thread worn word games of the addicted. Let's wait. Let's study this. Let's find a different place for this abomination (a clean source of electricity!) Let's caricature the whole thing so that people won't see that it's a great idea! Let's pretend a shoal (a navigation and grounding hazard) is a national treasure and let's all go out and hug it. Let's say that this particular foul area (a nautical term for a shoal) is the source of ALL fishing ANYWHERE! Let's say we really don't mind paying the oil pusher we know for clean electricity pusher we don't. Let's say and do anything to stay on that crude oil. Let say that its public land and that an evil company wants it! Let's say no public dollars for industry! Really? Like the millions and billions, we already give for any biotech company that wants to come to MA? How about tax dollars for filmmaking in MA? Tax dollars for nuclear power industry? Tax dollars for the student loan industry? Tax dollars for the blind (on the 1040 if you are blind you get tax relief, but sorry for the deaf, down syndromes, Alzheimer's, and quadriplegics). Lets get serious folks, look in the mirror and say the reason your are against Cape Wind is the fear of the unknown, the fear of change, the fear that a cushy life has instilled in the privileged. Cape Wind was economically competitive at $35 a barrel; it is now $111 a barrel and 2 billion people in China and India are discovering its many wondrous uses. Get over yourselves and go clean and green this for the children. There are numerous pros and cons for the Wind Farm;but, to put it simply, I'm in favor.